The miniaturization of electronic and electro-mechanical systems, including sensors, computers, and flight controls enable designers to create innovative ‘flying sensors.’ Sensors that can deploy autonomously or under human supervision to extend human perception – vision, hearing and situational awareness. Given the small dimensions of such platforms, they can be operated by a single person who carries several such pieces in their pouches. 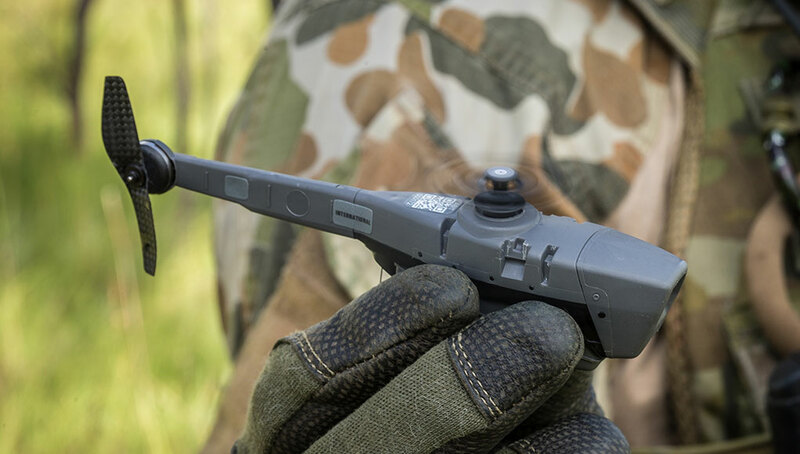 Although small drones – helicopters and multirotor – are commercially available for several years, they have yet to find their right place in the military. 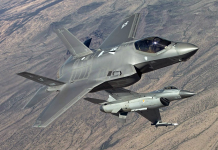 Limited payload weight and endurance, unreliable communications – particularly over the extended range or in urban terrain, and environment congested electronic interference and limited power on board, are all limiting factors for the military use of commercial systems. 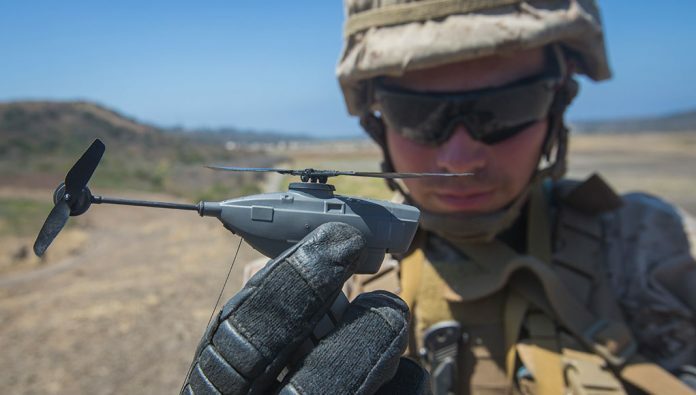 Some small multirotor drones are designed specifically for military purposes. One example is the InstantEye Mk2 Gen3 developed by U.S. based company Physical Science Inc. (PSI.) This folding quadrotor vehicle is deployed in seconds, on missions that can be operator controlled or autonomous. InstantEye features three cameras – forward, angled, and downward, with multiple zoom levels. The center crosshairs provide the GPS location of the viewpoint when looking at the ground or the vehicle’s location when looking forward. 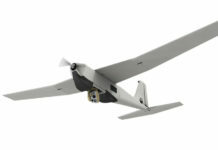 Weighing 320 grams InstantEye can carry payloads of 450 g (with the 2Ah battery, or up to 300 grams with the 4 Ah battery that extends mission endurance beyond 30 minutes). Among the additional payloads, it can carry are infrared LED floodlight, GoPro HD or FLIR thermal cameras. 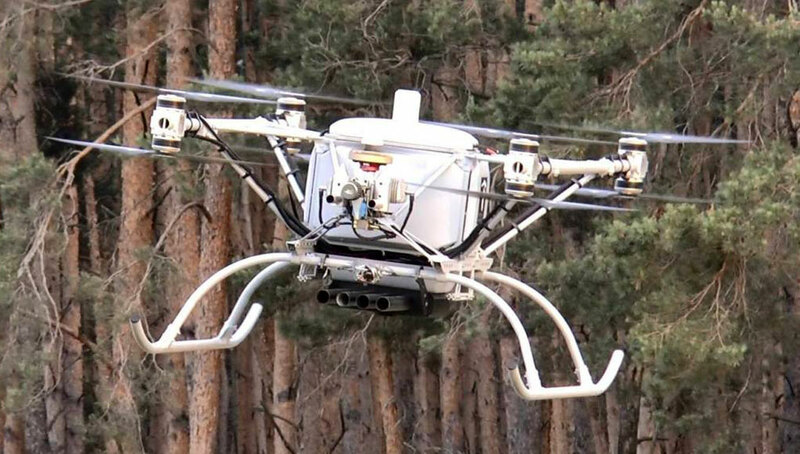 The drone has an effective range of 600-1400 meters depending on terrain, with endurance exceeding 30 minutes. The ground control station uses the same batteries the drone uses and can run for two hours after a 30-minute recharge. One of the development goals for PSI is to allow the drone to fly indoor, perform its mission and avoid obstacles. 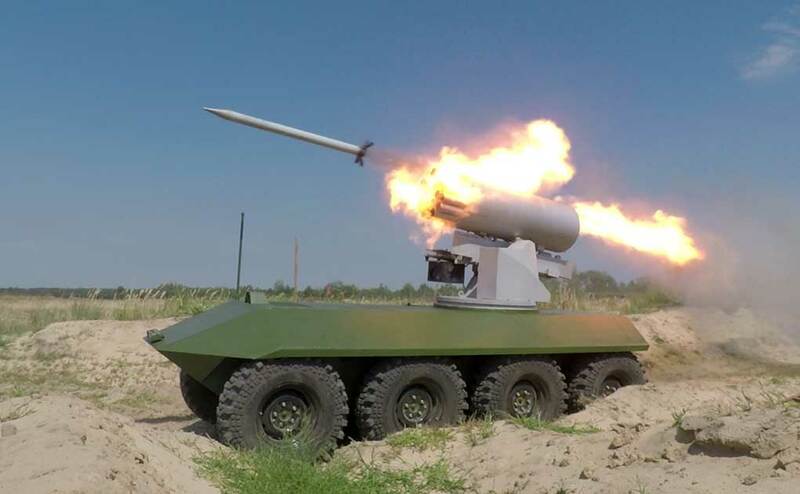 A dedicated payload for this capability will use multiple sonars and a wide angle forward-looking camera to detect large obstacles and avoid them – walls, furniture, and people. Downward and upward sonar maintain a safe vertical distance from the floor and ceiling and enable precise ranging for the monocular optical odometry. 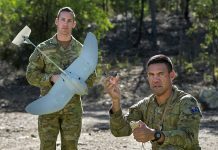 As sonar and vision can’t detect all obstacles, with 100% accuracy, all the time, the drone has to be prepared to survive collisions with objects (such as twigs, windows, or fast moving obstacles) and continue its mission. For this purpose, propeller shrouds are employed. 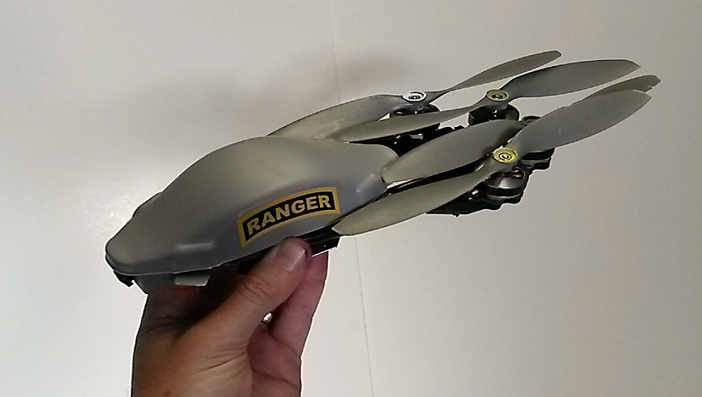 A folded InstantEye bot can be stowed in a pouch and is unfolded into a ready-to-fly drone in 10 seconds. Photo: PSI. PSI’s is also developing an indoor payload that will enable a swarm of InstantEye vehicles to enter, map, and return to the user – all without user intervention. 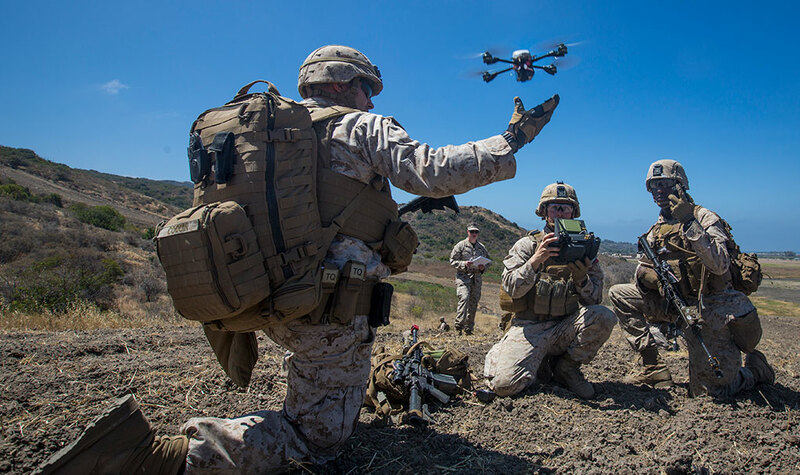 Using Simultaneous Localization and Mapping (SLAM) algorithms these drones will allow warfighters to conduct autonomous mapping missions without line of site and radio link. This work is sponsored by the Office of the U.S. Secretary of Defense in conjunction with the Air Force Research Labs out of Eglin Air Force Base. Algorithms were designed in simulation, validated on existing hardware, and are currently being implemented into the InstantEye framework. PSI is currently designing a lighter and smaller version of the InstantEye, which uses folding arms to reduce stowage size. Unfolding the drone will take about 10 seconds. A smaller InstantEye is also in the making, with a vehicle weight of about 120 grams, stow in the size of a cargo pocket, and be aurally undetectable 50 feet away.